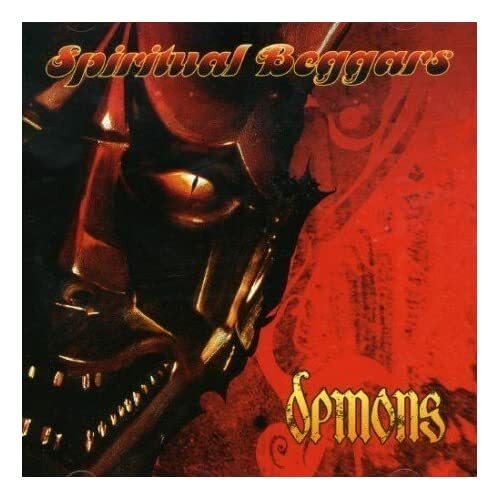 The Album Of The Week is "Demons" by Spiritual Beggars. "The stoner rock/metal pool is a considerably large one, full of bands venerating the 70's sound of the giants such as Sabbath and Deep Purple. As with most cult genres, there is a lot of rubbish floating about, and often the music is extremely one-dimensional and simply ripps off the sound. Of course there are some real gems around, and certainly "Demons" is a gravely overlooked stroke of genius. For one thing the general feel of the album is far superior to many of the stoner bands. The initial impression of the special edition version is accomplished, dark and refined cover art, recalling the mysterious and tongue-in-cheek stylings of Sabbath. This is wonderfully fresh when you consider the somewhat token art of many stoner bands, such as Bongzilla and Monster Magnet's wacky colours and cover designs. So straight away you get the sense of a "serious" group of musicians trying to professionally re-create the olden metal days with a new twist. And the job is done very admirably. The first thing that strikes me about this album is the fantastic groove throughout that never at any point becomes tiresome. Too many times these type of bands simply re-hash repetitive riffing, but on "Demons" Amott's guitar writing is spot on. Sumptuous time changes and riff chopping/changing that simply floors you as a listener, making you guess the next direction they will take makes this a display of refined and ultimately skilful playing. There are plenty of straight up hard rock songs, such as the energetic "Throwing Your Life Away", which acts as a perfect kick-start after the scene-setting intro. The next two tracks are once again simplistic in approach but executed with such energy and power, the chorus to "Salt In Your Wounds" is extremely catchy, and the commanding vocal delivery from JB in "One Man Army" is sure to get your adrenaline going. The last of the simple formula comes in "Treading Water", which while being decent, is possibly the weakest track on the album, as it simply becomes a bit mundane after a few listens. In between the formulaic (but still very fun) rockers, Amott shows off his writing and playing ability on some absolutely gorgeous pieces. This is mostly in the middle of the album, in the form of "Through The Halls", "Dying Every Day", "Born To Die" and "In My Blood". These songs simply ooze class, mostly in the structure department, for example the dreamy, swimming verse and chorus of "Through The Halls" gives way to a thunderous sludging riff with excellent time changes and flowery guitar work. "Dying Every Day" is perhaps my favourite part of the album, it flows through so many different directions seamlessly, from the adrenaline pumping main riff, the slower dreamy chorus, then (similar to "Through The Halls") into a massively heavy low end riff, some more fine solos, time changes, riff changes...quite simply everything you can desire from a classic metal song. "In My Blood" is definitely the heaviest song on the album; JB's low growly vocals give it a dirty, gritty feeling, complemented perfectly by the most brutal of riffs, a definite killer track. Mention should also go to the fine closer `No One Heard', possibly the darkest song on the album with a fine `bleak' quality that ends a superb album with a fine sophisticated edge.